Gustave Doré (1832–1883), Engraving to accompany 'Barbe Bleue' (c 1862), engraving in Les Contes de Perrault, Jules Hetzel, Paris. Wikimedia Commons. My second coloured beard story will be more familiar to those of you who still cherish nursery tales: it is that of Bluebeard. 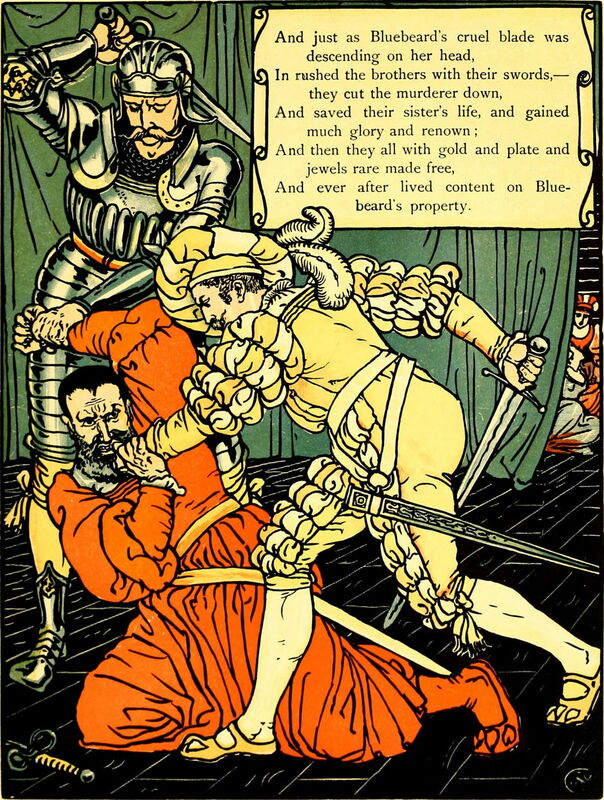 Most probably originating in Breton legends, possibly with a nobleman who had fought alongside Joan of Arc but was later convicted of serial murders, the story of Bluebeard has been retold in many different forms and media since it was first recorded and published by Charles Perrault in 1697. Bluebeard is a wealthy and powerful man, with a certain frisson about him, including worrying rumours about his many marriages and disappearing wives. One beautiful young woman – in some accounts, the youngest daughter of his neighbour, against her will – is chosen to be his next wife, and goes to live with him in his extensive palace in the country. 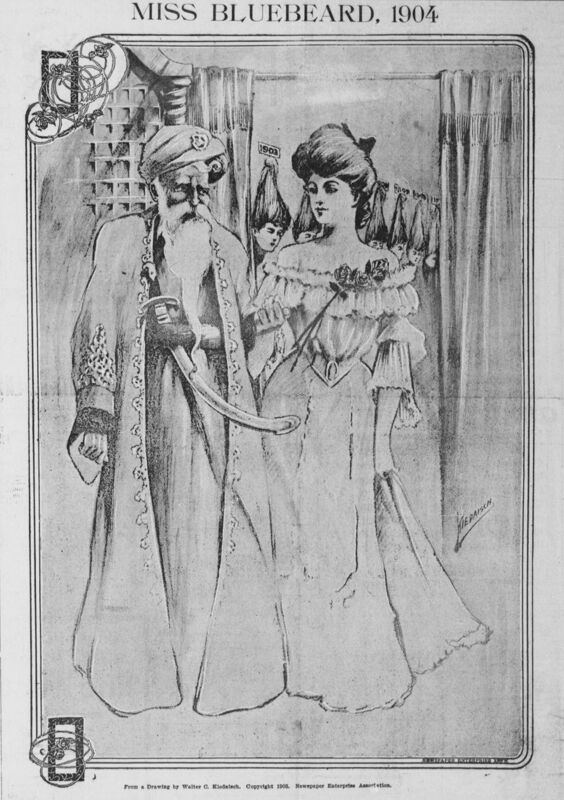 After their marriage, Bluebeard tells his new wife that he must go away for a while, and leaves her the keys to the palace. He explains that she is given complete freedom to explore and use the rooms, but there is one which she must not, under any circumstances, enter. His wife invites her sister and friends over to enjoy the palace with her, and explores its many rooms and riches. The wife eventually cannot resist entering the forbidden room, which she discovers is covered with blood and contains the bodies of Bluebeard’s previous wives, each hung on a hook. In her panic, she drops the key in the blood, rushes out, locks the room again, and tries to clean the key. She discovers that she cannot remove the blood from the key, so decides to flee the palace the next day. Bluebeard then returns unexpectedly, discovers the key still covered in blood, and flies into a rage. He tells his wife that she will join those corpses, but allows her one last prayer before he kills her too. The wife then goes out and awaits the arrival of relatives whom she is expecting. 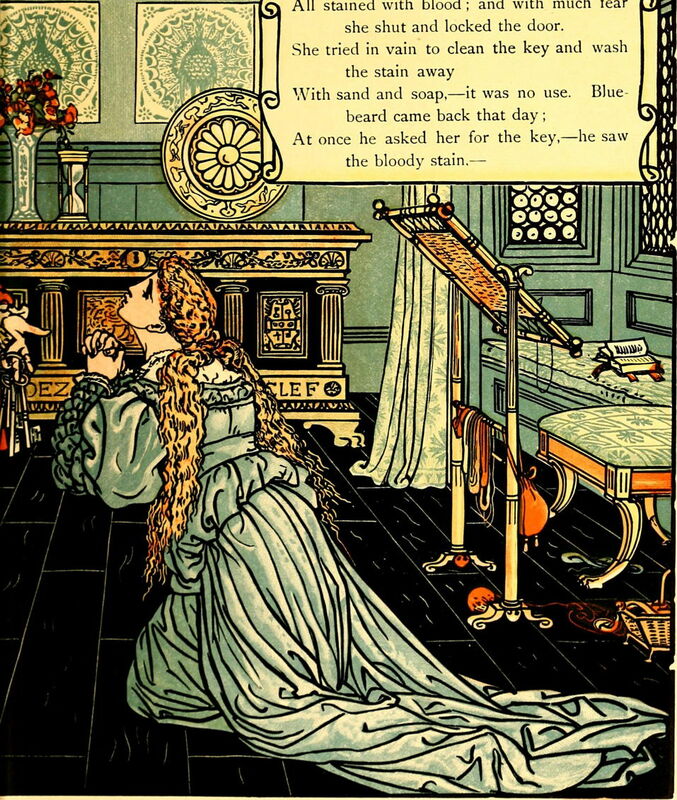 Bluebeard calls her down, and prepares to murder her. Just in the nick of time, his wife’s relatives arrive and kill Bluebeard. His wife inherits his palace and wealth, and has Bluebeard’s dead wives buried, and lives happily ever after (as she always had to). This story has been retold in several books containing nursery stories such as that of Cinderella and the Sleeping Beauty. Its account of a horrific serial murderer is clearly not for telling in explicit detail. Although words can remain subtle and leave much to the imagination, it is a tough challenge for the artist to tell visually. Even showing the contents of the forbidden room seems unwise for such young and impressionable audiences, but it is central to the story. 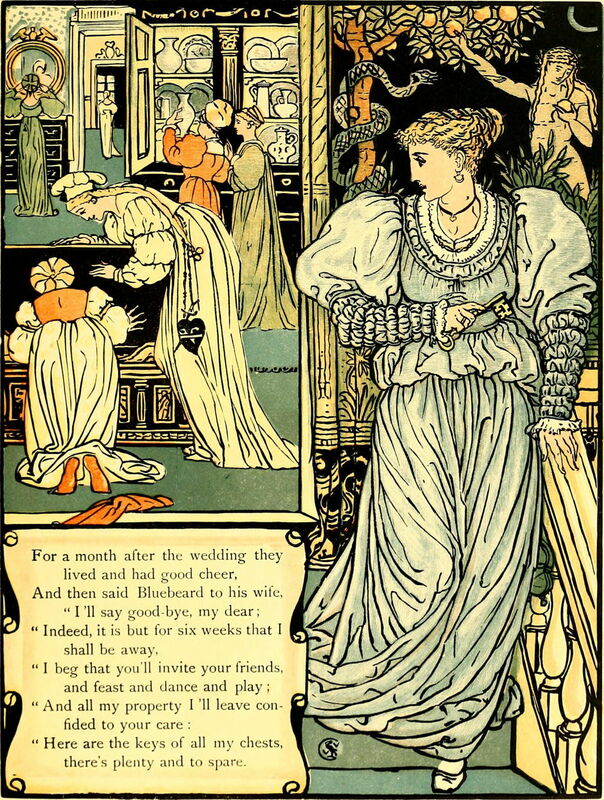 The most complete series of illustrated pages, containing the story in rhymed verse and illustrations, appears to be that made by Walter Crane, one of the best illustrators (and painters) of nineteenth century Britain. I also have a set of four engravings made by Gustave Doré, one of the best illustrators and painters of nineteenth century France. After those, I show three illustrations by two other artists, for their individual interest. 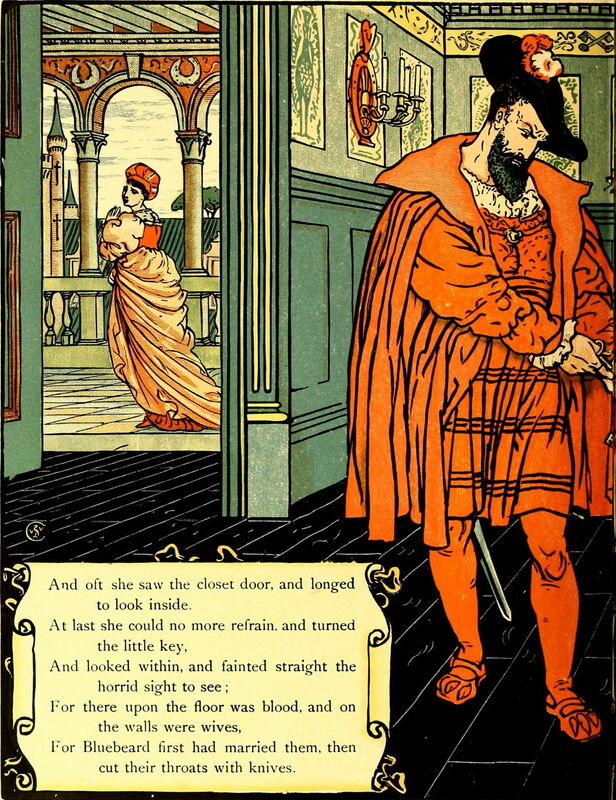 Walter Crane (1845-1915), Illustrated page for the story of Bluebeard (before 1911), in ‘The Sleeping Beauty Picture Book’, Dodd, Mead and Co., New York. Wikimedia Commons and archive.org. And this poor wife, distracted, picked the key up from the floor. All stained with blood ; and with much fear she shut and locked the door. 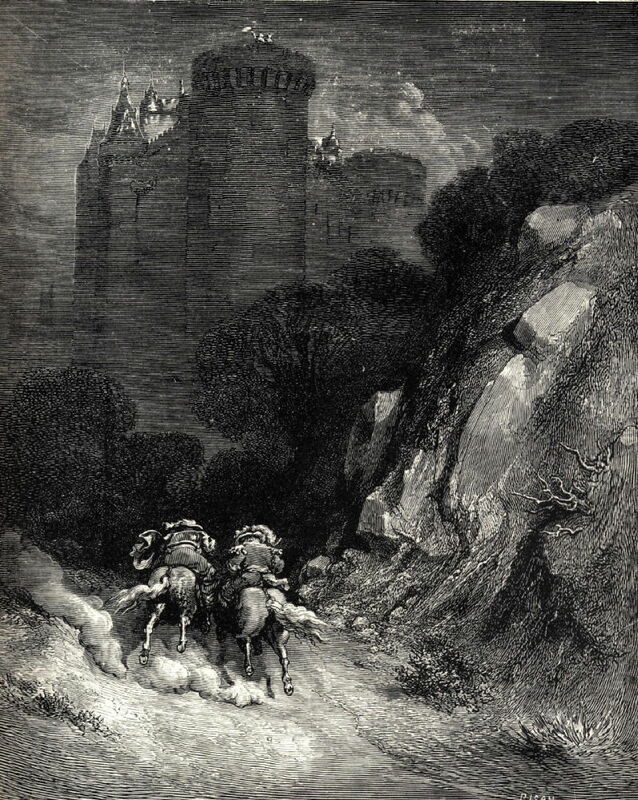 Doré provided a set of four engravings to illustrate the original French, taken from Charles Perrault’s text of 1697. Gustave Doré (1832–1883), Engraving to accompany ‘Barbe Bleue’ (c 1862), engraving in Les Contes de Perrault, Jules Hetzel, Paris. Wikimedia Commons. 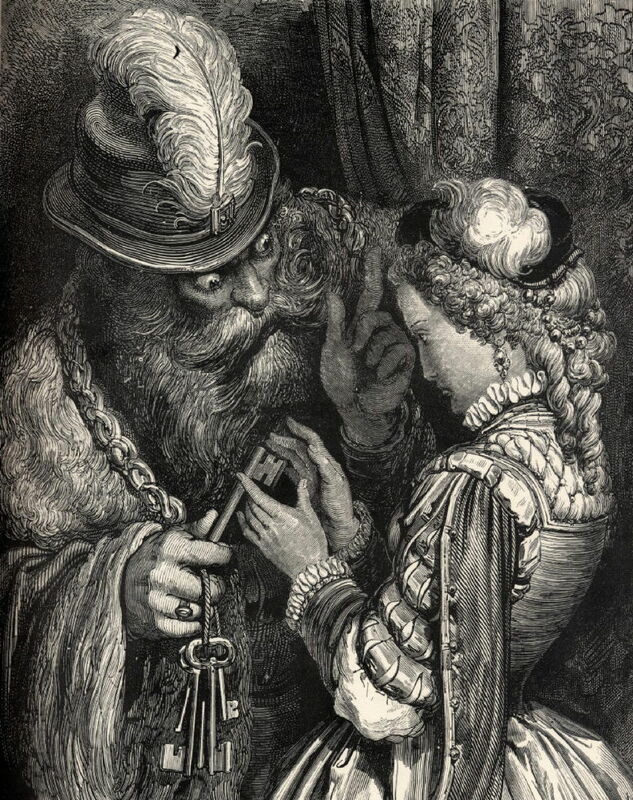 The first shows a pop-eyed Bluebeard handing the keys to his young wife just before he departs. Doré’s characterisations are wonderful here, particularly of Bluebeard, who appears to be a cross between a benevolent uncle and an evil gnome. Doré follows the original text, in which the wife explores the riches of the palace with her sister, as shown here. He skips the tricky section of story altogether, it appears, and rejoins it as the wife’s two relatives come racing up to the château on horseback. 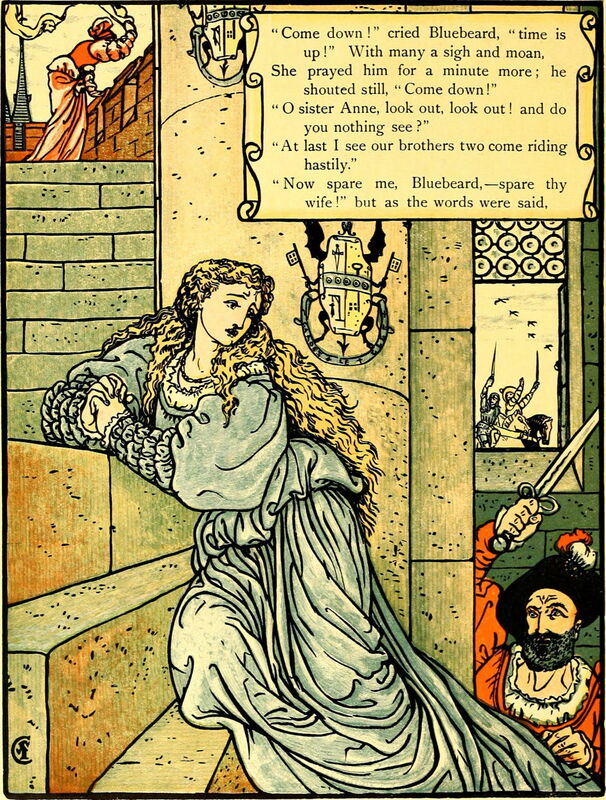 The final engraving shows those relatives about to kill Bluebeard, leaving his wife still shocked in the background. 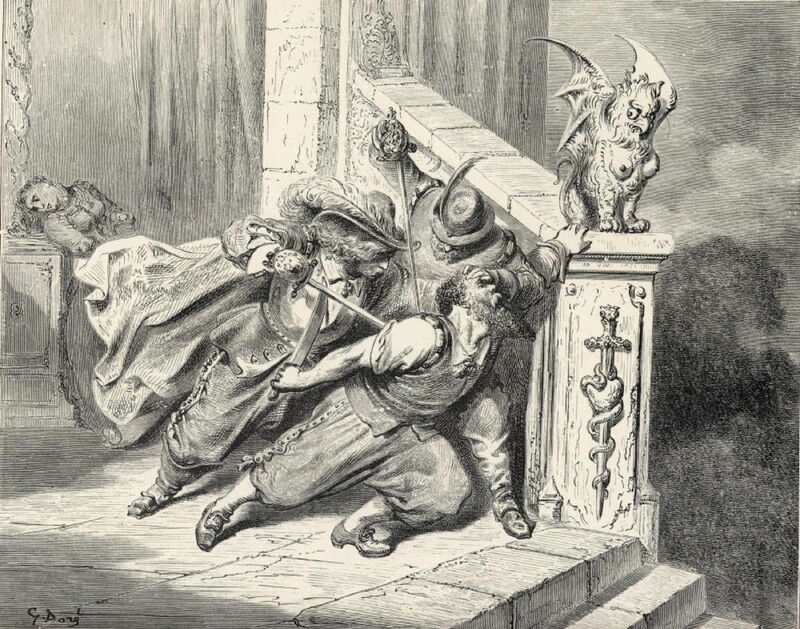 Doré works in some wonderful detail here, in the amusing griffon watching proceedings from its place on the wall, and the caduceus/sword carved below it. 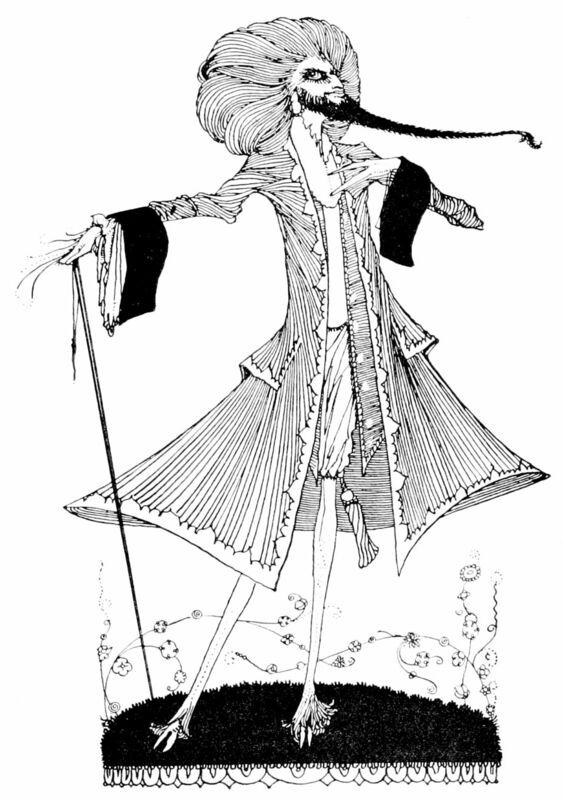 I have two illustrations made by Harry Clarke, who seems to have been an admirer of Aubrey Beardley’s style, with even sharper elements of caricature. 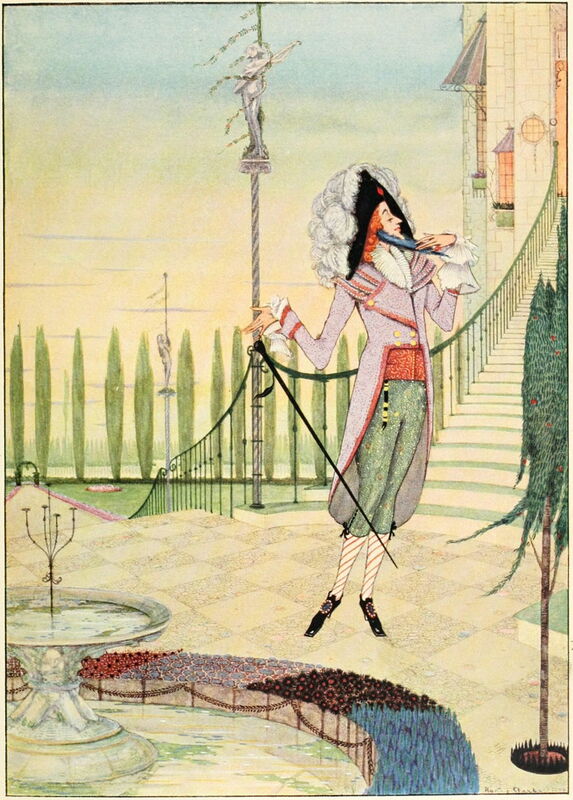 Harry Clarke (1889-1931) Illustration for the story of Bluebeard (before 1922), in Charles Perrault ‘The fairy tales of Charles Perrault Perrault’, Harrap, London. Wikimedia Commons. 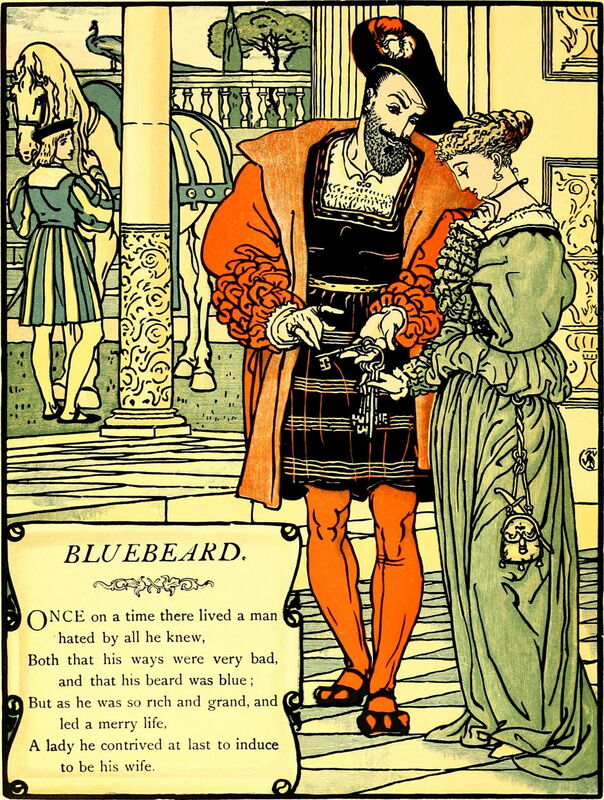 That is the only image in which I have seen Bluebeard’s beard depicted as being blue. My final illustration is by Walter C Kiedaisch, and was made as a New Year’s Day print with which to celebrate the New Year in 1904. Walter C. Kiedaisch (1878-1960), New Year’s Day illustration (1903), further details not known. Wikimedia Commons. I presume that this must have been aimed at an adult audience, for its explicit display of the heads of Bluebeard’s previous wives. The artist also plays on racial stereotypes, which is quite uncalled for. 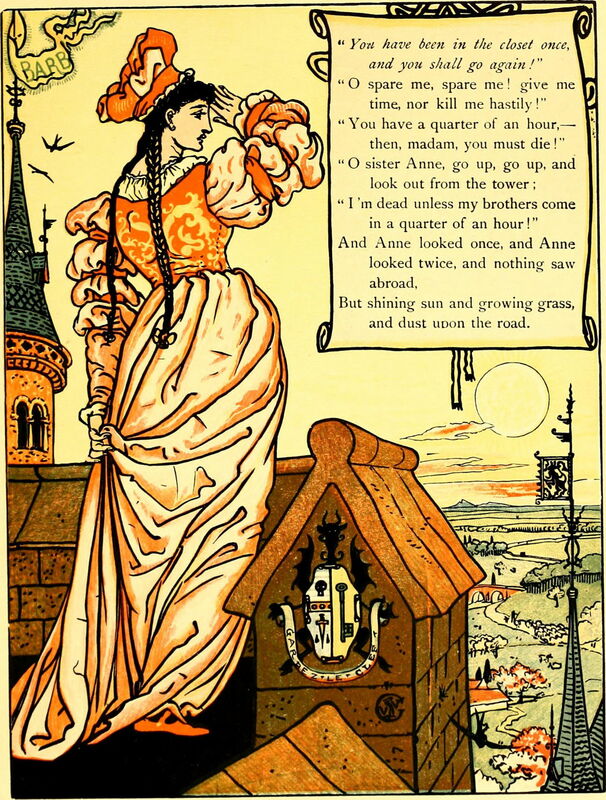 This illustration is odd for its indication that ‘Miss Bluebeard 1904’ calmly walks arm-in-arm with her murdering husband after she has seen those heads. Kiedaisch may have been referring to one of the other, changed re-tellings of the story. As an exercise in visual storytelling, Crane and Doré’s solutions appear acceptable for the nursery, and are lessons in making parts of a story implicit even when working in such a visually explicit medium. I still can’t think why any parent would ever want their young children to know this story. Can you? 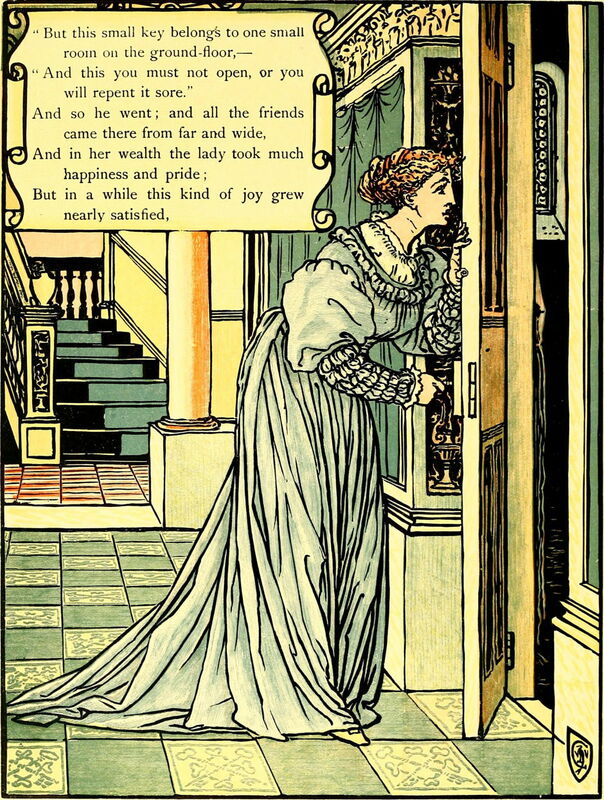 Walter Crane’s book is available from archive.org here. A 1921 text edition of a retelling by Anatole France is available from archive.org here. Posted in General, Language, Life, Painting and tagged beard, Clarke, Crane, Doré, Kiedaisch, legend, narrative, painting. Bookmark the permalink. Thanks for these illustrations. 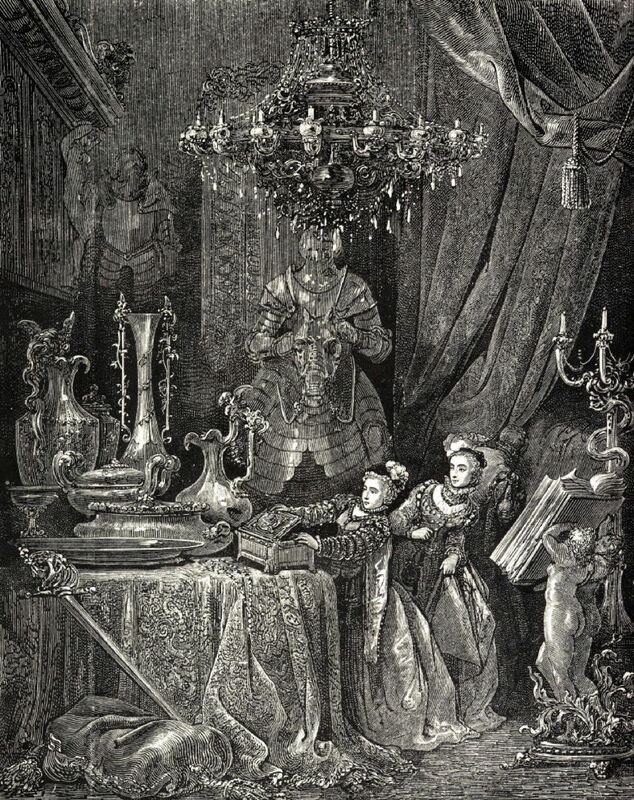 I was not familiar with the original Perrault story nor its illustrations except for the first of the Doré engravings. If you are not familiar with it I can recommend Béla Bartók’s reworking of the story as a striking one-act opera with just the characters of Bluebeard and Judith his wife who insists on opening each door in turn in Bluebeard’s presence before joining his three previous wives behind the seventh door. Interestingly I have just had a short discussion on Twitter about the Balázs/Bartók story of Bluebeard’s Castle. The Romans and Greeks had a very accommodating approach to myths and legends, which tolerated multiple versions without their seeing any need for a single ‘correct’ or authoritative account. Although quite a different story, the opera is clearly founded on this, and makes a brilliant opera, as you say. It is generally much harder to change the storyline in painted narrative, than in opera or textual narrative, although it does sometimes happen, as with Salome, as I have examined earlier here.